November | 2014 | Scuffalong: Genealogy. November 2014 – Scuffalong: Genealogy. Goldsboro, N.C. Sept 19, 1905. On the 1st day of Oct 1906 for value received, with interest from date until paid at 6 per cent, per annum, we, or either of us, promise to pay Bennett Live Stock Co. or order twenty seven 50/100 DOLLARS, for bal[illegible] 2 horse Hackney wagon years old which stands security for this note and remains their property till paid for. And as further security for said indebtedness I hereby sell and convey to ________ the following property, to-wit: ________________ with full power to close this lien as provided in Section 1800 of the Code. /s/ Napoleon Artis. Witness Don Scott. Goldsboro, N.C. Octo 26, 1905. On the 10 day of Jany 1906 for value received, with interest from date until paid at 6 per cent, per annum, we, or either of us, promise to pay Edgerton & Edgerton or order One hundred & two DOLLARS, for One bay mare about 8 years old and said mare 9 years old which stands security for this note and remains their property till paid for. And as further security for said indebtedness I hereby sell and convey to ________ the following property, to-wit: It is understood that if $5.00 is paid in this note the balance is to stand until the 1st day of Octo 1906 with full power to close this lien as provided in Section 1800 of the Code. /s/ Robert E. Artis, June Scott Artis. Witness Walter Sasser. Napoleon, Robert and June Scott were sons of Adam T. Artis. Napoleon’s mother was Frances Seaberry; his brothers’ was Amanda Aldridge. From Lien Record Book 44, Register of Deeds Office, Wayne County Courthouse, Goldsboro NC. Statesville, North Carolina. April 2011. 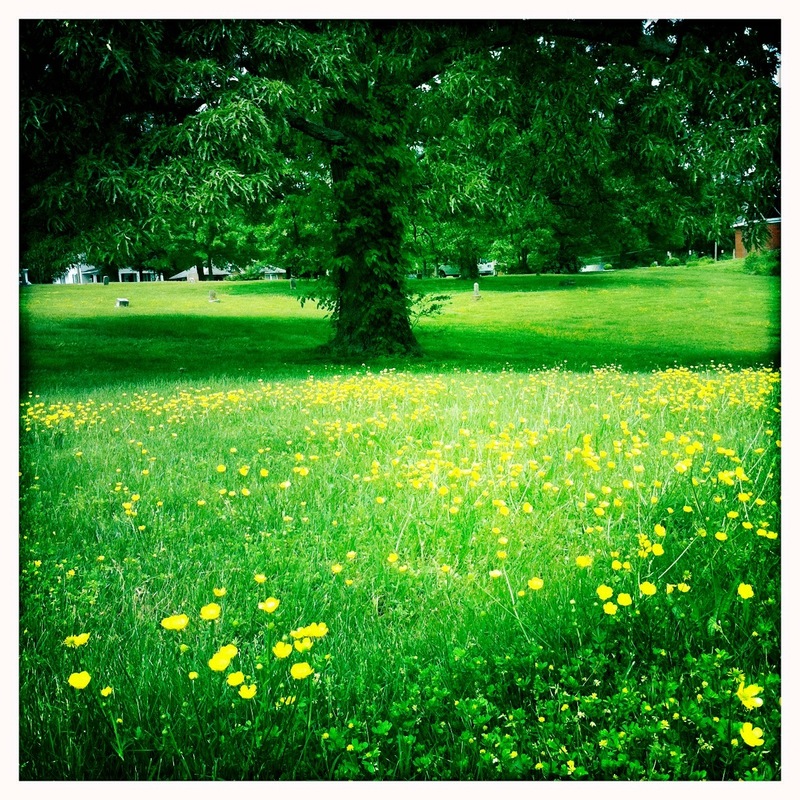 Green Street cemetery, Statesville, North Carolina, abloom in buttercups. Though largely empty of headstones, this graveyard is probably close to full. Most of the existing stones, including that of my great-great-grandfather John W. Colvert, date from 1890-1930 — ex-slaves and their children. For some, it is the most detailed record of their lives. One: MARY WILLIAMS passed away Mar. 13, 1917 in her 94th Year Blind cheerful her simple faith was an inspiration Rest in peace Aunt Mary. When the Welch-Nicholson House was nominated for the National Register of Historic Places in 1980, it was being used for storage and in parlous condition. Already nearly 200 years old, it seemed unlikely to me that the place could still be standing, much as I hoped it might. Over the weekend, I sent a message to Ann Swallow, National Register Coordinator at the North Carolina Historic Preservation Office of the North Carolina Department of Cultural Resources. I wanted to know if the original application file for the house was available for perusal by researchers. First thing Monday morning, she responded. Yes to my question, but this: “We were informed in early 2014 at the end of a survey conducted by the North Carolina Department of Transportation that the house was no longer standing.” Ms. Swallow kindly attached two photos of what’s left. So. There will no emotional return to the house in which my great-great-grandmother Harriet Nicholson spent her earliest years. Day 2. Ancestry DNA has rolled out its better “mousetrap.” A new and “improved” way of identifying genetic relationships. I dropped from 80 pages of matches to 17. I lost a known 4th cousin (whom I match at 23andme, FTDNA and Gedmatch). I’ve lost nearly all the distant Euro-descended matches that lent credence to speculation about some of my white ancestors. I’ve lost all but three “shaky leaf” shared ancestor hints. I have no Circles. I’ve gained some new matches. Most have private trees or no tree at all. None have shaky leaves. None share my surnames. This is not a win. I knew the new analysis would disproportionately negatively impact non-whites, adoptees or those who otherwise have limited information about their ancestry, and I’m waiting vainly for an authoritative acknowledgment of that fact. All I’m seeing are cheery reassurances that this really is for the greater good, you’ll see. These comments seem blind to the realness of the loss of so-called “false negatives.” This is privilege on display. For people whose genealogies descend in orderly, documented ranks, free from slavemaster paternity or undocumented marginalized others — onward and upward. For the rest of us? This is not a win. A few weeks ago, I ran across a reference to Joel Craig and Sharlene Baker’s As You May Never See Us Again: The Civil War Letters of George and Walter Battle, 4th North Carolina Infantry (2004). George and Walter were sons of Amos Johnston Battle, a prominent (and peripatetic) Baptist minister who spent his last years in Wilson County. I wondered if the brothers mentioned any of the family’s slaves in their letters, so when I was at home I stopped by the Wilson County Public Library to skim their copy. Two things struck me: (1) given Hugh B. Johnston’s confident identification of Amos Battle as the owner of my ancestor Cherry, was his possession of slaves a question? (2) “abolitionist” is a mighty strong word to describe anybody coming out of Wilson County. First, I did what I’ve apparently never bothered to do — check the 1850 and 1860 federal slave schedules for Amos J. Battle. He appears in neither, but his wife Margaret H. Battle is listed with 32 slaves in 1860. 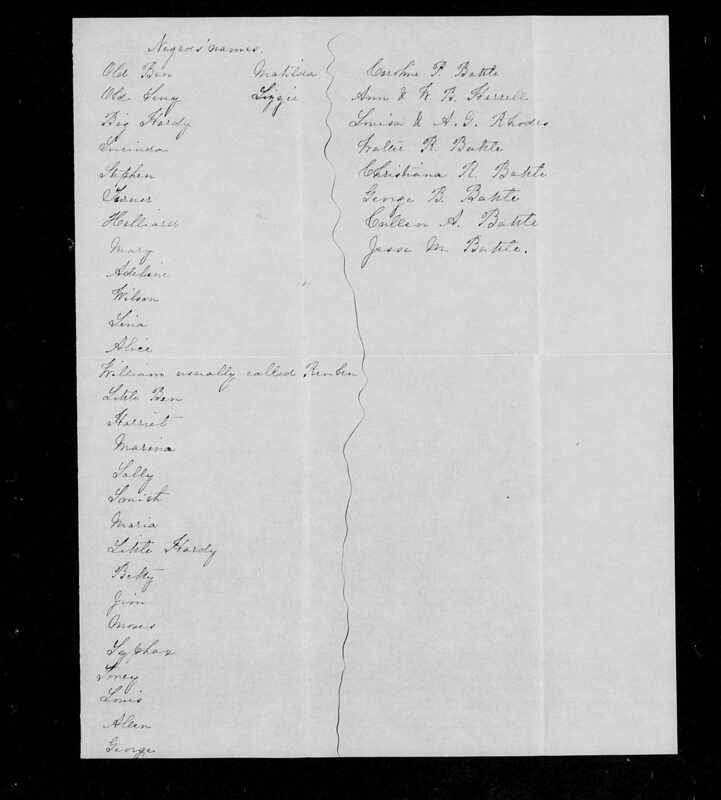 (Hugh Johnston noted that Amos Battle’s “wife owned a small farm north of Wilson not far from the Barnes plantation.”) She is not listed in the 1850 slave schedule, and the sudden acquisition of that many slaves suggested inheritance. After figuring out her maiden name (Margaret Hearne Parker) and father’s name (Weeks Parker) I went looking for estate records. Old Ben, Old Seny, Big Hardy, Lucinda, Stephen, Turner, Hilliard, Mary, Adeline, William, Lena, Alice, William “usually called Reuben,” Little Ben, Harriet, Marina, Sally, Smith, Maria, Little Hardy, Betty, Jim, Moses, Syphax, Toney, Louis, Allen, George, Matilda, Lizzie. I was disappointed not to find a Cherry listed among them, but intrigued nonetheless. Would Weeks Parker’s will shed more light? Weeks’ bequests to his daughters are curious though. After Sabra’s death, Simmons was to hold in trust slaves Lucindy, Stephen, Turner, Lewis, George, Marina, Tony, Matilda, Caroline, William, Holly, Big Hardy, Ben, Cena, Moses, Syphax, Little Hardy, Jim, Lucy and Little Jim “for the sole and separate use and benefit of daughter Margaret H. Battle wife of Amos J. Battle during her natural life free from the management and control of her present or any future husband.” Similarly, he directed that Simmons hold in trust after Sabra’s death slaves Barbara, Sarah, Luke, Ned, Sophia, Elick, Harrison, Milly, Jeffrey, Dorcas, Silas, Bill, Lou, Julia, Randal, Will and Abner for the benefit of daughter Henrietta Battle. Why the specific attempt to keep Amos Battle’s hands off his wife’s property? Was he in fact an abolitionist likely to try to free them? Or were Weeks’ concerns more prosaic? Simmons and his mother went into court to have Weeks’ will admitted to probate, and the skirmishes began. The two sets of Battles teamed up to claim that they had not been notified prior to probate and that the will’s codicil had been made under undue influence. Simmons and the other trustees admitted that Battles may not have been given formal notice, but claimed that they knew anyway. They also charged Amos Battle with having taken a slave named Jim to Wilmington. The Battles fired a second volley with a claim that Simmons was in “extreme bad health” and “great physical inability” and “utterly incapable of carrying out his duties” as a trustee. Simmons responded meekly, acknowledging that he had been shot in the chest many years before and had never recovered, a circumstance that sometimes completely debilitated him. He agreed to surrender his trusteeship. Nathan Matthewson, too, stepped down, and was replaced by Benjamin Oliver of Duplin County. In one of Oliver’s reports, he advised the court that he had sold for $600 a slave named Jim “in consequence of grossly bad behavior and general bad deportment.” The buyer was Wyatt Moye. With the funds received, Oliver then spent $500 to purchase Lilah from a Dr. Arrington. (She later gave birth to a son Charles.) In 1849, Oliver moved to Bladen County and resigned his trusteeship; Uriah Vaughan of Hertford County — where Margaret then lived — was appointed in his stead. In the mid-1850s, Margaret, Amos and their children moved to the town of Wilson, where Sabra Parker bought them a house and lot. In another plaintive petition for yet another trustee, submitted in September 1856, Margaret complained that she had no other property and that the family was “dependent on their own exertions for a support” as their trust fund was inadequate. The younger children were chiefly supported by Margaret’s “exertions” [she was an innkeeper], while the creditors of her husband Amos, “who is greatly embarrassed,” tried to take her earnings at every opportunity. Ah. So. And therein lies the motive for Weeks Parker’s determined attempt to keep his wealth out of pious Amos Battle’s hands. In the end, I still don’t know if Hugh B. Johnston was correct about Cherry Battle Barnes’ ownership, but I have confirmed that Amos J. and Margaret Hearne Battle owned slaves and that some of those slaves worked on a farm just north of Wilson, not far from where Cherry lived at the time of the first post-Emancipation census. Will Book F, Edgecombe County, North Carolina Probate Records, 1735-1970, familysearch.org; Estate of Weeks Parker (1844), Edgecombe County, North Carolina Estate Files, 1663-1979, familysearch.org; other sources as named. The life of Joseph R. Holmes, radical. I’ve written of Joseph R. Holmes’ death. What of his life? The details are sketchy and poorly documented. Nonetheless, here is what I know. Joseph R. Holmes was born circa 1838, probably in Charlotte County, Virginia. His parents are listed as Payton and Nancy Holmes on his death certificate. I don’t know what the “R” stood for. According to Luther Porter Jackson, Joseph had a brother named Watt. According to my great-aunt Julia Allen Holmes, he also had a brother named Jasper Holmes, born circa 1841, who was her grandfather. The “Inventory and Appraisal of the Personal Estate of Capt. John H. Marshall,” filed in Charlotte in June 1857, lists 20 “Negroes,” including Joe, $600; Peyton, $900; and Nancy, $1000. There’s no Jasper. Nor are there any children bearing the names of Nancy’s younger children, some of whom who were born before 1857. Thus, though I’m tempted, I can’t draw any conclusions about whether these enslaved people are Joseph R. Holmes and his parents. 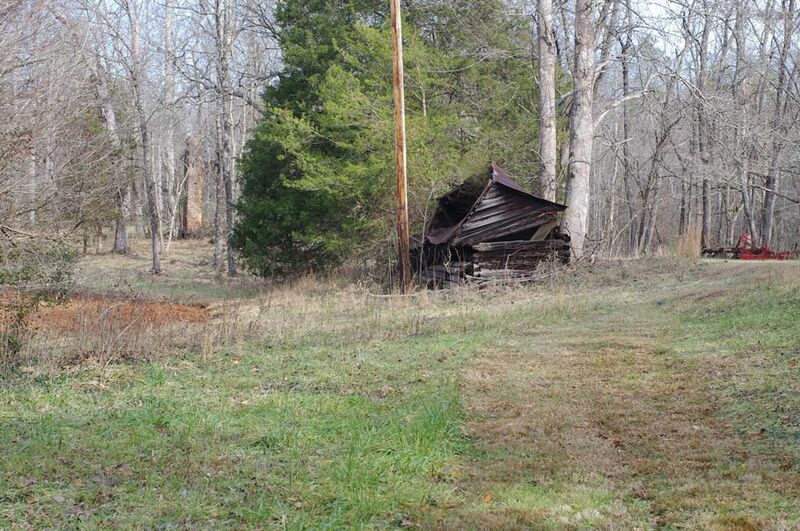 Joseph probably was last owned by John H. Marshall’s son, judge Hunter Holmes Marshall, whose plantation “Roxabel” was (and still is) located about five miles west of Charlotte Court House. Joseph learned to read and write most likely as a child, as he exhibited a well-formed penmanship when in his mid-20s. However, according to “Shooting in Charlotte Court House,” published in volume VIII, number 2, of The Southsider quarterly, Joseph served as a butler for Marshall, then became a cobbler and opened a shop on the Kings Highway (now U.S. Route 360) near Dupree’s old store. Some time around 1865, Joseph married Mary Clark, born about 1849 to Simon and Jina Clark of Charlotte County. The couple had at least four children: Payton (1865), Louisa (1866), Joseph (1867) and William H. Holmes (August 1868). Tax records filed in Charlotte Court House for 1866 list Joseph R. Holmes in District #2 (T.M. Jones, revenue commissioner), paying one black poll tax, as well as taxes on four hogs valued at $5 and $20 worth of real property. I have not found a deed for this property. On 3 May 1869, Joseph was shot and killed in front of Charlotte County Courthouse by a group of men that included John M. Marshall, Griffin S. Marshall, William Boyd and M.C. Morris. The Marshalls were sons of his former master. In the 1870 census of Walton, Charlotte County: Wat Carter, 70, wife Nancy, 70, and children Mary, 23, Liza, 17, and Wat, 16; plus Payton, 4, Louisa, 3, and Joseph Homes, 2, and Fannie Clark, 60. I strongly suspect that Nancy Carter was Joseph Holmes’ mother and Wat, his stepfather. The young children are clearly Joseph’s. Mary may have been his half-sister, but more likely was his widow.) The younger Wat is likely the “Watt” referred to L.P. Jackson’s book. Joseph Holmes, age 12, son of Joe and Mary Holmes, died 11 March 1880 in Charlotte County. Birth, death, marriage and court records at Charlotte County Courthouse, Charlotte Court House, Virginia; other records as noted. Thanks, as always, for the incalculably valuable assistance of Kathy Liston. 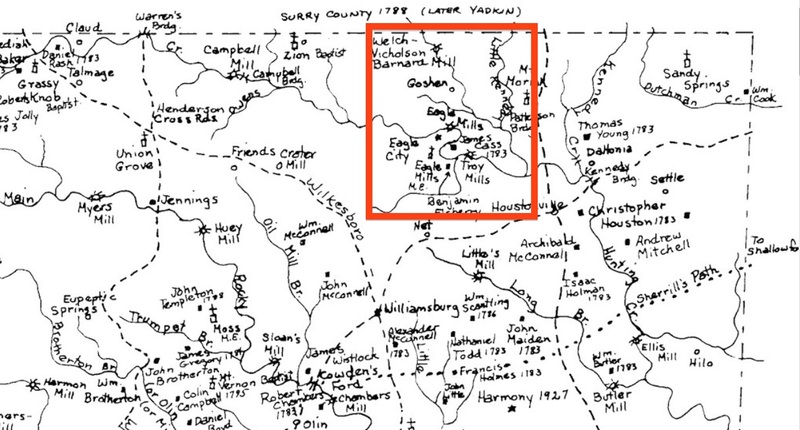 Historian and genealogist Margaret Miller created and holds the copyright on this map of early Iredell County settlers and landmarks. The county, taller than wide, stands on a narrow foot, and I’ve excerpted a section that covers roughly the top fifth of its territory. The world of my 19th-century Iredell County ancestors was largely contained within the borders of the superimposed red box. There, just south of the Yadkin County line, is the Nicholson Mill that anchored the farm that James Nicholson bought in 1826. His half-brother John Nicholson lived on adjoining land, and their children Thomas A. Nicholson and Rebecca C. Nicholson married in 1839. Thomas and Rebecca reared their children in the house James had owned, and their slaves worked both the mill and the farm. One enslaved woman, Lucinda, likely worked with Rebecca in the house and, in 1861, gave birth to a daughter, Harriet, whose father was Thomas and Rebecca’s son Lee. That same year, Lee married Martha Ann Olivia Colvert. In the early 1870s, the adolescent Harriet Nicholson met John Walker Colvert, a 22 year-old farmhand still living on the farm at which he had been born a slave. That farm, which is also where Martha “Mattie” Colvert was reared, was near Eagle Mills, the ill-fated cotton mill on Hunting Creek due south of Nicholson Mill. Mattie’s father William I. Colvert, an early small-scale industrialist, had been a partner in the development of Eagle Mills in the 1850s. 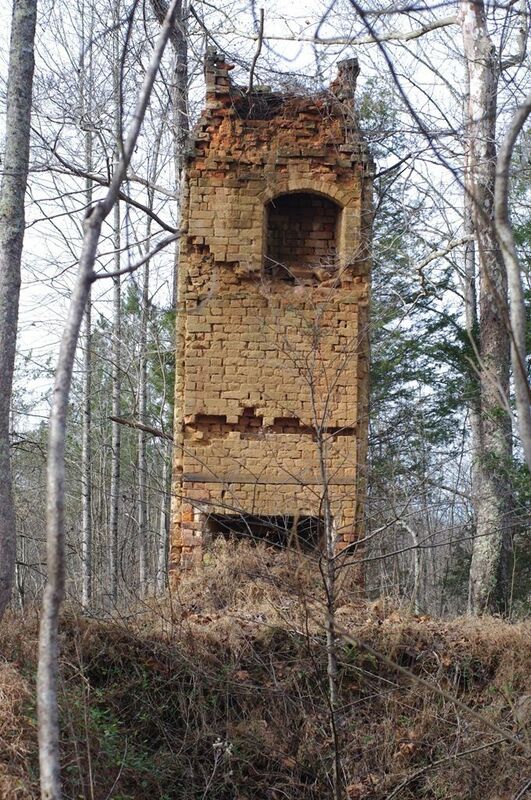 William’s father John A. Colvert had died just a few years after arriving in Iredell County, and William — still a child — had inherited a boy named Walker Colvert, later the father of John Walker Colvert. Just a few miles apart as the crow flies, Nicholson Mill and Eagle Mills were the poles of the community in which Harriet Nicholson’s family and John Walker Colvert’s family lived for generations before merging in my great-grandfather, Lon W. Colvert.